The physical characteristics of wool that determine the price you receive are heavily influenced by genetics, level of nutrition, time of shearing, contamination (such as vegetable matter), and the way in which the wool is prepared for sale. In addition, any given wool type is subject to supply and demand factors that may alter within a wool selling season (short term factors) or between wool selling seasons (long term factors). The wool pipeline from sheep producer to customer is long and complex. A simplified outline is presented in tool 2.1, figure 1. Around seventy percent of Australian fleece wool and skirtings are destined for the worsted processing sector (60mm plus) whereby all short fibres are removed then the longer fibre combed parallel to each other and joined at the ends then worsted spun. Ten percent goes to the semi worsted process (45mm to 60mm) which involves the combing of fibres in parallel then woollen spun. The balance is made into woollen yarn used in knitwear (less than 40mm) where fibres are carded (fibre brushed back and forth) with varying lengths going in many directions and overlapping at different angles. Prices received for raw wool are heavily influenced by physical characteristics. Over the past few selling seasons the three major physical factors affecting raw wool prices adversely in the market have been the position of break in the middle (pobm), overlong length (gsl) and AWTA certification suffix descriptor type. Discounts were applied by the market to sale lines that exhibited high pobm readings over 85pobm, lines that tested over 110mm in greasy staple length and to lines with certificates not being suffixed with a P (farm lots) tested. These fibre characteristics are influenced by flock breeding programs (see procedure 9.2 in Gain from Genetics). 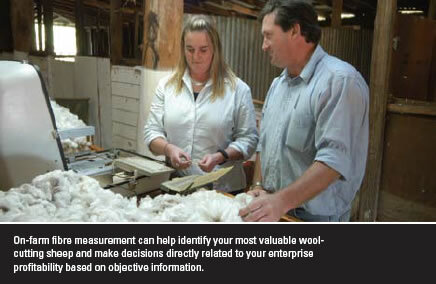 Tool 9.10 in Gain from Genetics – the on-farm fibre measurement (OFFM) calculator – can help you assess the expected financial benefits of applying OFFM to your wool enterprise, separated into clip preparation, breeding and selection. Pasture management throughout the year (see procedure 8.3 in Turn Pasture into Product) and shearing date can also be important influences on wool characteristics. Certification type has an influence on price received. Issues often arise by the lack of enough similar wool to form a grower sale line resulting in wool having to be bulk classed (B & Q certificate suffix) in brokers store, wool grower choosing to not use the services of a registered wool classer (D certificate suffix) or small lines not considered commercial by grower or wool selling broker that need to be inter lotted (I certificate suffix). Discounts are applied by the market to all such certified sale lines, and broker advice should be sought to determine the best options available. Lighter individual bale weights can also affect price returns, with handling costs per kg being the issue to the market. The quantity and quality of wool on offer does not match current buyer demand. Unusually or unexpected higher number of bales of similar wool types in sale weeks can often bear down on price levels and conversely lower than expected numbers can place upward pressure on market returns. Major trading currencies shift, eg, a sudden rise in the Australian dollar may cause wool prices to decline at short notice. Wool brokers and advisers have current information to help you better understand these short-term factors. Processing efficiency often requires wool to be of different types and from various growing districts and farms. It offers processors the opportunity to maintain continuity of supply of a similar blend throughout the year. The practice of blending affects the supply–demand cycle. Wool can be blended with different types grown within Australia and also wool from other countries to maintain a consistent, continuous supply of a particular blend. This may explain price volatility for the same types of wool at auction on the same day and as processor orders are filled. An increasing consumer preference for light-weight apparel fabrics. Spinners and weavers have responded accordingly by increasing their demand for finer wool. Fashion trends and economic growth in the major industrialised countries. This affects consumer demand for textiles. Wool competes with synthetic fibres (polyester and acrylic), and natural fibres (cotton, cashmere, mohair and silk). Long-term trends in currency exchange rates. Growing casualization in the workplace is causing a reduction in the wearing of suits by business people in many traditional markets. Counteracting slightly this trend is the uptake of suiting in some non traditional markets in developing nations. Manufacturers are altering production processes to match and anticipate growing demand in markets for wool products, with the outdoor sportswear and next to skin lightweight garment sector a target. Formerly worsted spinner manufacturers have or are converting and replacing machinery and production to semi worsted and knitwear capable operations, requiring different greasy wool requirements. Generally this indicates a stronger demand long term for shorter (40 to 70mm gsl) length wool. Sheep producers choose the type of sheep and wool that best suits the farm’s physical characteristics, management operations and production environment. Once a micron range and breeding line are selected, find out what characteristics or specifications processors require within that wool type, particularly those wool characteristics influencing price. Changing shearing date, lambing time or increasing stocking rate. In all cases, assess price information over a number of consecutive years, use your personal knowledge of the wool market, seek advice from your brokers’, and/or brokers’ management services to interpret the variations in price and consider potential financial gains. This market sector places extreme importance on excellent preparation of sale lines with an emphasis on uniform staple quality counts and strength. The cloth resultant from this area of production inevitably reaches the shelves of only a few of the world’s leading luxury tailors and commands an exclusive price tag, so any faults are extremely and heavily discounted. Low vegetable matter content percentage is essential. An Italian trade adage of “the finer the micron the better the wool has to be” should be kept in front of mind. As there are limited markets for this type of greasy wool, keeping closely up to date on demand is key to being active in this market sector. A well developed relationship through your wool selling agent to the manufacturer is important, not only in reaching satisfactory price returns, but in staying abreast of the latest technical specifications required and demand expectations. With most of the production in this superfine category heading for suiting and luxury apparel markets, the buyers of this wool are expecting an overall higher quality raw material than coarser merino types. Ideally the staple strength should be showing an additionally measured reading of above 35nkt. The ideal staple length of lines should be between 70mm gsl and 90mm gsl as a guide, and as even in length as possible, avoiding mixing short fibres and overlong through the main lines. Quality counts should be visually adjacent and consistent. As a specialty area of wool production, the superfine market segment also places a strong emphasis on the wool grower’s clip preparation standards. Wool producers can expect to receive a premium for sale lines within an obviously well prepared clip. Significant discounts are applied to superfine clips that exhibit inconsistent quality and poor preparation, as the better wool in this sector is generally destined for sensitive, higher value end uses such as Italian men’s suiting and women’s apparel lines. Growing consumer trends for lighter weight, trans-seasonal and softer garments that can be worn next to the skin is increasing demand in this sector, with the development of new knitwear items in particular supporting raw wool price. As this area of production is mostly treated as the “commodity market” of the wool industry, high average fleece weights are vital to a productive enterprise being achieved. The broader the fibre diameter the more weight of wool is needed per head as market pricing reduces lower for each point of a micron. While the fibre diameter remains the key pricing variance factor, the percentage of position of break (pobm) in the middle test result has grown in its influence on price. Raw wool characteristic discounts are less stringently applied by the trade in this category and clip preparation standards are not overly demanding, although minimum code of practice standards are mandatory to achieve full market support. Medullated and dark fibre free. With a good portion of the crossbred (25 to 32 micron) wool produced heading into the long knitwear sector, the ability to dye the end garment into modern day fashion pastel colours remain a key component. Where possible all kemp, medullated and dark fibre should be kept separate, as these faults can lead to heavy discounts for the crossbred wool producer. The most important attribute of carpet wool fleece wool (33 micron to 40 micron) that can influence the price received is a thick stapled durable wool type that will not break down under heavy use. Major end use destination of downs wool is in the bedding and quilting manufacturing area. This requires a spongy quality in the wool which is the foremost influence on price. Vegetable matter content needs to be low in order for simply scouring rather than the more expensive and sometimes damaging process of carbonizing the vegetable matter out of the fibre. The AWI Australian Wool Production Forecasting Committee publishes a forecast of Australian wool production four times a year to provide the best possible estimates of future sheep numbers for wool production (see signposts). The committee releases its forecasts of production as a press release with a report that provides detailed forecasts, historical data and commentary on the key drivers of the forecasts. This report is a useful planning tool for wool producers. Establish an information database or spreadsheet for your own wool clip to record annual production levels, quality and quantity of wool sold by category and price received for each wool type. Review this database/spreadsheet regularly to track progress towards your wool quality and production goals and embed it in your business plan (see procedure 1.1 in Plan for Success). Landmark market reporting services www.landmark.com.au/wool/wool-weekly-292.html. Wool Weekly is also available by fax by calling 1800 629 396. AWEX Market Reports and full market pricing information are available on a subscription fee basis and are distributed either via fax or email. These reports are available daily and weekly. Specific reports relevant to your production enterprise can be individually tailored to your requirements. To subscribe contact AWEX by E-mail at subscriptions@awex.com.au. Many wool brokers not listed offer personalised client log in services for market information and reporting, which are not accessible to public viewing. Wool sales: The auction sales provide a valuable tool in providing production comparison to your wool clip. On the wool show floor, not only look at your own wool samples, but take the time to view and compare other wools grown from your local district. During the auction, take note of prices received by other growers. The wool sales can also provide opportunities to interact with many of the exporters, giving a global perspective on pricing, preparation and future demand issues.